With the resurgence of the Ford Y engine making a comeback as a viable replacement power plant for more than just mid-Fifties Fords, there is suddenly a demand for both modern performance and old school looks being in the same package. And nothing speaks old school as well as performance as a dual four barrel setup. As I had previously dyno tested the different three deuce intakes, the time was now ripe to do a similar test with the various dual quad intakes. 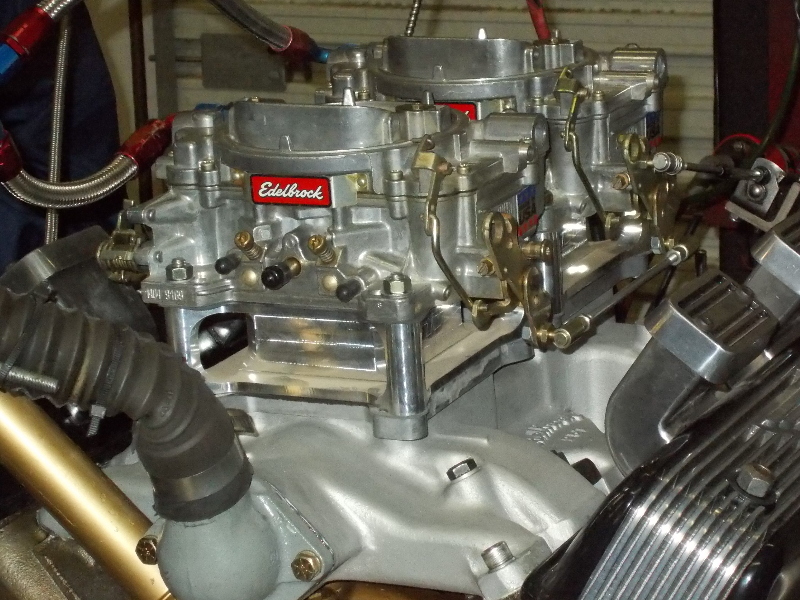 This dual quad intake test becomes much more complex due to wanting to also test a variety of carburetor pairs to also discern if there was a performance advantage to the carbs themselves. 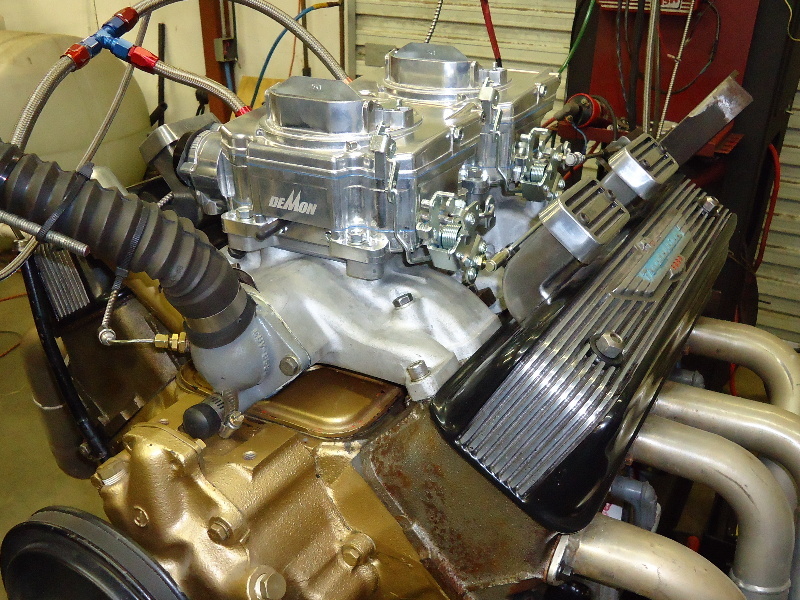 So with a more definitive test in mind, the call went out for as many different carbs and intakes so that an extensive dual quad test could take place on the 312+ dyno mule. And the response was overwhelming. Many intakes were loaned and a multitude of carburetors were either loaned or donated to the cause along with a variety of carb parts and jets. And a variety of dual quad air cleaners were also provided to do some definitive testing on those. More on that series of tests further down the road. And to make the tests go much more smoothly, both Vic Correnti and Tom Drummond stayed for several days to help with the manifold changes and subsequent tuning. Also showing up during the testing and getting their hands dirty with intake and carb changes were Karol Miller, Randy Gummelt, Joe D. Craine, and Bill Myrand. Thanks to all for the help as it would have been much more difficult otherwise. The test engine for this series of tests is Bob Martin’s old 1956 Merc engine that was originally provided as a core for his current engine build. That core engine was rebuilt and has subsequently been used as a dyno mule for a series of different tests. This engine is a +060 over 312 with the replacement cast pistons sitting ~.025” in the hole at TDC. The camshaft is the same cam Bob raced in his ’56 Mercury for thirty plus years. That cam is a Seventies era Crower Monarch grind sporting 280° adv duration, 238° dur at 0.050”, .450” lift, ground on 110° lobe centers and installed 2° advanced or at 108° intake lobe centerline. Harland Sharp 1.6:1 roller tipped rockers works the valves. 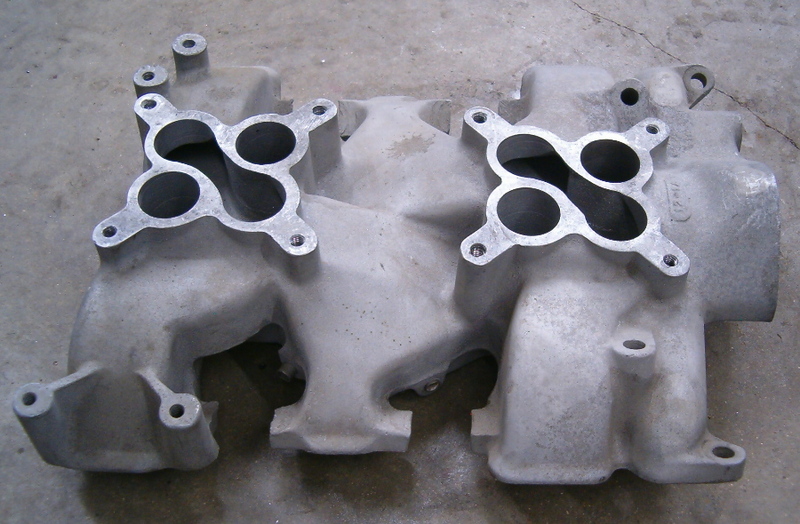 For this Part I of the 2X4 intake testing article, the heads are a set of mildly ported 113’s and for Part II (scheduled for the next issue of YBM) a set of Mummert aluminum heads are installed on the engine. The aluminum heads are thrown into the fray simply to eliminate any questions in intake manifold performance that may be related to a restriction in head flow. If there is a choke point, it ideally needs to be at the intake so any differences in intake manifold design can be brought to the forefront during the testing. Karol Miller had dropped by and when discussing the upcoming dual quad testing and showing him some of the carbs to be used, he pointed out that he had removed most of the choke horn cover from the Teapots that had been used for his record setting Daytona run in 1957. With that in mind, a pair of 1956 312 L1161-2 Holley Teapots were modified accordingly. While they do look naked without the choke horns, they do prove to perform better overall than similar carbs with the choke horns in place. This becomes more evident where the iron heads are changed out to the aluminum units later where head flow restriction becomes less an issue. The first order of business was setting some bench marks or base lines for the testing. This was accomplished by running the engine in a single four barrel format. And in doing this, it was decided that three bench marks would be established with one being with the 1956 ECZ-A intake, the second being the 1957 ECZ-B intake, and the third being a Mummert aluminum intake. All the intake manifolds are stock and unmodified while the carburetor used on all three for bench marking purposes is a tried and proven 750 cfm Holley with vacuum secondaries. An adapter was used to allow the use of the 750 Holley on the Teapot flanged ECZ-A intake and that particular intake was also tested with three different carbs; a Lincoln Teapot Holley, a 600 cfm Holley, and the aforementioned 750 cfm Holley. While each larger sized carb did increase the power output, the difference in horsepower between the Lincoln Teapot carb (~500 cfm) and the 750 Holley was only 3 HP which indicates a serious flow restriction in the ECZ-A manifold. 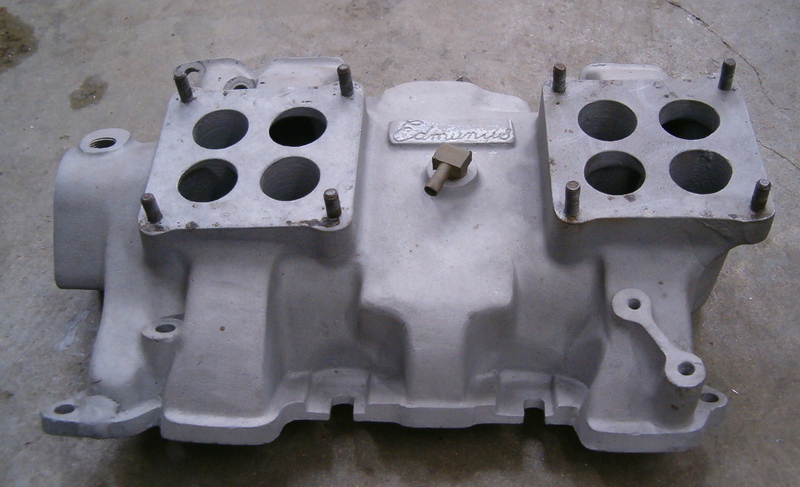 Ford engineering was definitely at the top of its game with the introduction of the ECZ-B manifold for the 1957 models as it was a very noticeable improvement over the previous year’s intake manifold design. Why three benchmarks? These would represent three different performance levels depending upon the time frame or era that the dual quad intake testing could be referenced back to. The ECZ-A intake would represent what the typical performance build would have represented in 1956 while the ECZ-B intake would represent a performance build starting in 1957 and what would be the standard for the next forty plus years. And the Mummert intake would set the standard for what a dual quad intake would at least need to equal to for matching modern day performance. First on the list of intakes was an original 1957 ECG-D dual quad intake with the factory supplied L1434 dual quad model 4000 Holleys (Teapots). With the factory jetting in place (45P/55S), the peak numbers are 285HP@5200 and 336TQ@3600. 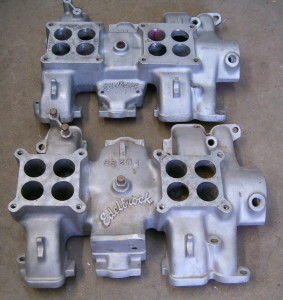 Changing the carbs out to the pair of KM modified 1956 312 L1162-2 Holley Teapots netted 288HP@5200 and 322TQ@3400. Next was a pair of Mike Suter reproduction dual quad Teapots and the numbers for those after rejetting was 273HP@5200 and 319TQ@3400. And the final carb change for this intake would be a pair of L1094-1 Lincoln Teapots with the numbers peaking at 296HP@5200 and 338@3700. The Lincoln Teapots required the secondaries being worked mechanically due to the vacuum secondaries not pulling in quickly enough. Some tinkering with the secondary springs would have likely cured that but there was a chance in the damaging the aged diaphragms so it was not attempted. 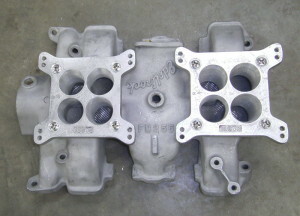 The picture on top is the 1956 EDB-C intake. The lower picture is the 1957 ECG-D manifold. Next on the list was a highly modified Edelbrock p/n 257 dual quad intake. The plenum dividers had been completely removed and the only divider material that remained was in the runners themselves. 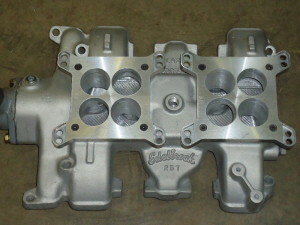 Because the low end torque values were so dismal, this intake was tested only with the Lincoln L1094-1 Holley Teapots. The peak numbers ended up being 272HP@5200 and 305TQ@3800. This intake had extreme difficulty in loading the engine on the dyno at 2500 rpms. This was a stock unmolested intake and the testing started with the Lincoln L1094-1 Teapots. The peak numbers for those were 296HP@5300 and 341TQ@3500. The next pair of carbs was the KM modified L1162-2 Teapots and they peaked at 303HP@5200 and 332TQ@4200. 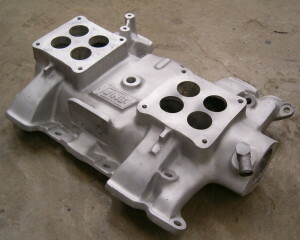 Carb adapters were then installed and a pair of 625 cfm Steet Demon carbs were bolted in place. After jetting and other adjustments, these two carbs peaked at 309HP@5400 and 343@4300. Top picture: Edelbrock 257 intake on top and Edelbrock 255 intake on the bottom. 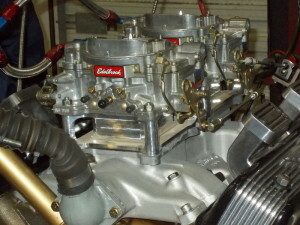 Note the difference in the carburetor spacing. 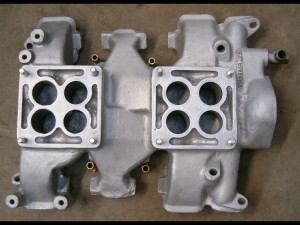 The lower picture is a ported Edelbrock 255 intake manifold. Another intake change and this time to the Joe Craine ported Edelbrock #257 with carb adapters and 2” HVH tapered carb spacers. The first pair of carbs to be tried would be the Street Demon carbs with the 55P & 72S jetting and the peak numbers would be 320HP@5200 and 342TQ@4400. 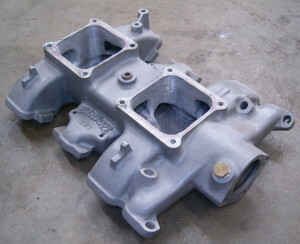 Next to try was a pair of Edelbrock 500cfm carbs. 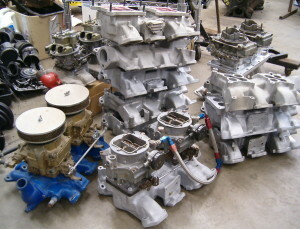 With just the carb adapters and 2” HVH carb spacers, these carbs peaked at 310HP@5300 and 335TQ@4400. Using the same carbs but removing the 2” carb spacers netted the following peak numbers: 304HP@5300 and 335TQ@4400. 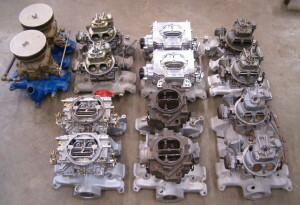 And here are the peak numbers with the Lincoln L1094-1 Teapots w/o the 2” carb spacers: 309HP@5300 and 347TQ@4100. With 311 HP being the best single four bench mark number, the Edelbrock #257 intake ported by Joe Craine was able to surpass that. The remainder of the dual quad intakes tested on the iron heads still proves that adding dual quads to your mid-Fifties era modified Y-Block was a great power adder back in the day though. And if you were replacing a single four Holley Teapot setup, you were taking giant leaps forward. The next installment of the Y 2X4 intake testing has the iron 113 heads off the engine and replaced with a set of Mummert aluminum heads. And this is where the testing gets even more interesting. While the same intakes that were tested on the iron heads get retested on the aluminum heads, the Fenton, Edmunds, Hogans, the 1956 Ford and Mercury factory dual quads (yes, they are different manifolds), and Edelbrock FM255’s also get throwed into the fray. Stay tuned and until next issue, Happy Y Motoring. Ted Eaton.